CBUS is the product of over 4 years development by MERG members Gil Fuchs and Mike Bolton. CBUS has gone through many stages of evolution and refinement including some major changes in direction but we are now at version 4 and feel it is sufficiently developed to formally introduce the scheme, not just for MERG members but the world at large. Our intention was to develop a system for comprehensive layout control based on a general purpose Layout Control Bus (LCB). The fundamental tenet was that of ‘simplicity’ without sacrificing ‘universality’– a difficult juggling trick. It had to be affordable and easy to install and set up by non-technical users. It also had to cover the range from small, simple home layouts to the largest and most complex club layout imaginable. Whether we have achieved this will only be resolved from subsequent experience. Examples of (2) are control panel switches, block occupancy detectors, bar code or RFID readers, turnout direction sensors, turntable position and ‘RailCom’™ track detectors. At the basic level, we wanted our system to both look and operate like a conventional ‘hard wired’ system having a control panel with switches to operate turnouts and simple route setting. It also had to allow use as a ‘CAB bus’ for DCC systems so handsets (CABs) could be connected to a DCC command station using the same wiring. At the other extreme, it had to allow full computer control, using multiple computers if necessary, and a fully automated layout with many thousands of inputs and outputs. Although it is early days, we feel we have achieved these aims, in principle at least. So far, I have referred to it as a ‘system’. The CBUS system can be regarded in two parts. The two are not completely independent as the style and frequency of the messages is determined by the hardware capability. However, I will describe them separately. 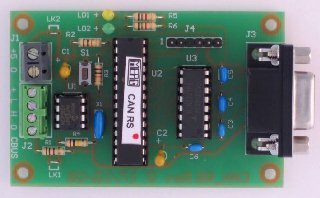 The CAN bus (Controller Area Network) was developed by the Robert Bosch company in the 1980s for use in motor vehicles but has since been applied to many other types of machinery including aircraft and medical scanners to name just two. It became an open international standard as ISO 11519 in 1994 and a higher speed version as ISO 11898 in 2003. It is now used in virtually all modern motor vehicles so there is a wide applications base and ‘off the shelf’ components are readily available. When we looked at CAN, it seemed pretty much the ideal for a LCB. It was intended for relatively infrequent transmission of small amounts of data between devices for control purposes where response times and safety were paramount. Unlike the more familiar ‘Ethernet’, it was not intended for shipping large amounts of data between computers. Another advantage of CAN was that it was already in use for a LCB by Zimo, so there was proof it worked in a model railway environment. The data rate chosen for CBUS is 125Kbps. This is one of the defined CAN rates which go up to 1 Mbps but there is a trade off against cable length. 125Kbps allows lengths of up to 500 metres, good enough for even most garden layouts. The wire should be a twisted pair but doesn’t need to be screened. Only the ‘standard’ CAN frame is used. After much debate, we settled on the ‘producer-consumer’ model at least for layout control. For those used to the idea of sending specific messages from A to B – a ‘source-destination’ scheme, this is a very different concept although widely used for industrial control systems. Imagine changing a switch on a control panel. This creates an ‘event’. A frame is sent on to the bus which contains no source address, no destination address, no information, just an ‘event’ number. The node sending an event is called a ‘producer’. All nodes capable of processing an event are ‘consumers’. Every consumer on the layout receives the event. What the consumer does with the event will depend on information already in the consumer. In effect, a consumer has to be taught what to do with any event it has to act on and to ignore events that are not relevant. This is an extremely powerful and very flexible arrangement. Producers can send many events. Many consumers can act on an event and in different ways. Consumers can also act in the same way for different events. CBUS is a ‘one to many’ scheme which means that a specific event number will be restricted to one producer only. The above description may seem rather abstract. I will use a recognisable example. You want a push button (PB) on a control panel to set a route and the corresponding signals. You have a producer node on the control panel. You have a number of consumer nodes that drive turnouts and signals. Let’s say the PB creates event number 1. Turnout controller A has been taught that event 1 means set turnout 1 to normal, turnout 2 to reverse. Turnout controller B has been taught that event 1 means set turnout 3 to reverse, turnout 4 to reverse and turnout 5 to normal. Signal drivers C and D have been taught that event 1 means set the various signals or aspects for that route. Pressing the one PB sets the route and all the signals in one go. Obviously, a different PB could send event 2. The various consumers would know to act on event 2 in a different way to event 1 so set a different route. With this P-C model, you have effectively transferred some of the decision making from the producer to the consumer. It still allows for computer control or assistance, such as interlocking, if the PC or other interlocking system is placed between the original producer and the final consumer. Now, the switch event is recognised by the PC (as a consumer) and when a decision has been made, the PC sends another event (as a producer) to the final layout consumers. Items like block occupancy detectors are producers of events so a PC can know if a block is occupied. While full PC operation is easily accomplished, it is equally easy to configure quite complex layouts without any ‘programming’ at all. The latter will be described in our small layout implementation model (SLiM). A CBUS message consists of a ‘command’ byte and an ‘event number’. The command byte is used to set the number of bytes in the message and define the type of event. For layout control we only use at present an ‘ON’ event and an ‘OFF’ event but for CAB bus implementation, a number of other ‘commands’ are also used. As nodes need to know how to respond to an event, there needs to be a mechanism for teaching them. Each programmable node is given a node number (NN) of 16 bits or two bytes. If nodes are to be unique, the maximum number of nodes is 65536 or 64K. Each producer node is allowed a further 16 bit range for its events giving a possible 4.29 billion events! The actual event number in a message is comprised of the node number and the node event so the final event is a 32 bit number. This allows events to be traced to a particular node as well as preventing accidental duplication of events from different nodes. Providing a consumer is a ‘receive only’ device, there is no limit to the number of these. In our SLiM model, such consumers are taught using on-board switches so a node number is not required. However, there are other limits for the number of nodes set by the CAN bus requirements. 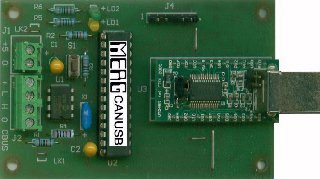 Each node requires a CAN transceiver IC which drives the bus with the CAN information. Currently available transceivers set a limit to the number of nodes on a bus ‘segment’ to 110. One of the features of CBUS is the complete separation of the message from the ‘transport’. Where more than 110 nodes are wanted, we can use repeaters that link different CAN segments. All that is sent between segments is the message (command and event) so each segment may have duplicate CAN frame arbitration headers. Given enough repeaters (CAN-CANs), the node limit is set at 65536 by the CBUS protocol. Figure 1 shows a simplified arrangement for a layout control scheme and figure 2 shows a CAB bus arrangement. The actual bus wiring is common to both. The new CBUS modules, the DCC Command Station (CANcmd) and Hand Controller (CAB1) now allow DCC operation to be fuly integrated in the CBUS environment, more details of the new modules are available on a dedicted page. The DCC modules can be used as a stand alone DCC system or fully integrated with other CBUS modules using either the SLiM or FLiM models discussed below. CBUS implementation – the SLiM model. 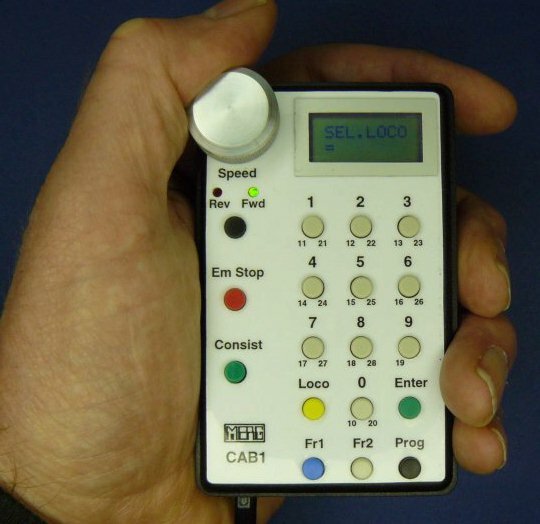 An 8 input switch / logic level detector, this node can generate an event corresponding to its input states in response to a ‘request’ event (which will be useful for interlocking and reading logic levels or switch positions). 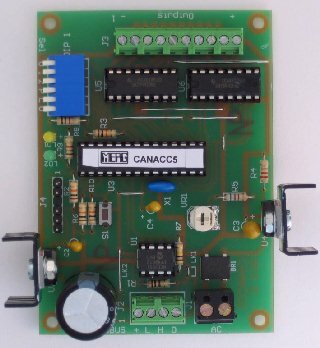 An 8 output relay / lamp / logic driver with adjustable voltage. 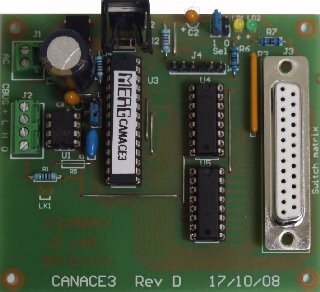 A CAN to RS-232 interface. Allows full operation of CBUS from a PC. Test software for use with the RS module available. The novel aspect of the SLiM CBUS system is the way the nodes are ‘taught’ how to respond to an event. The producers are provided with DIL switches which set their Node Number. The panel encoder has a two way switch, allowing 4 control panels on a layout. The switch input node has a 4 way switch allowing 16 such nodes, each with 8 inputs. Note, these are only hardware design constraints and not intrinsic to CBUS. The only requirement for these producer nodes is that no two may have the same number. The actual number is irrelevant. These producer nodes create events numbered according to their inputs as the lower two bytes. The upper two bytes of the 32 bit event are the node number. The SLiM consumers do not have a node number. They have a DIL switch to select an output, a ‘learn’ switch, an ‘unlearn’ switch and a ‘polarity ‘switch. To link an output with an input event, the following sequence is followed. The nodes are connected to the bus and powered up. One (or more) consumer nodes are put into ‘learn’ mode with their switches and the output to be associated with an event is selected on each with the DIL switches. 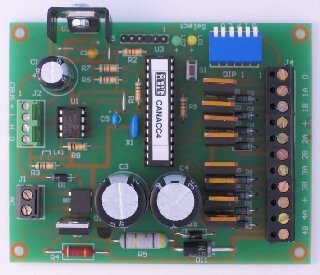 For the presently working turnout drivers, there are 4 outputs, for the relay / LED driver there are 8 outputs. The input on a producer is activated (say a control panel pushbutton) and it sends an event. The consumers remember this event and activate their outputs. You can check if the action is what you wanted. The action can be repeated as many times as you like. If satisfied, you take the consumers out of learn mode. All subsequent events with that event number will cause the same output actions. Currently, each event can be either ON or OFF while still having the same event number. This allows an input ON/OFF switch to be regarded as a single event producer. The purpose of the ‘polarity’ switch on the consumer nodes is to allow an output to work in reverse relative to the event. If this switch is set while learning, the output action is reversed. Apart from its use in setting routes, where some outputs need to be set and some cleared with the same event, it also allows different outputs on the same consumer to act in opposite directions. Thus two outputs can be ‘toggled’ with one event. Also, if using the 8 output driver, you can set multiple aspect signals to have a different aspect for each event – 256 possible combinations. The present designs allow each consumer node to remember 16 different events but this number can easily be increased. You can add outputs on a node to an event and also change the polarities. You can completely remove an event from a consumer by setting both the learn and unlearn switches and then sending the event. The possible permutations and combinations, even with this very simple scheme, are endless, ranging from a single control panel switch operating a single turnout to pushbuttons on different control panels setting the same complex route. If the turnouts are equipped with sensors (microswitches etc), these can be fed to a producer such as the 8 input node to create events to confirm turnout operation. 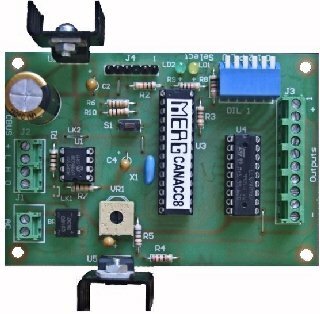 In turn these events may switch lights on a control panel via a LED driver module. A block occupancy detector with a logic level or ‘open collector’ output can create events via an input producer module. Here it would create an ON event when the block became occupied and an OFF event when cleared. The SLiM scheme does not need any programming device. The user doesn’t need to know any node or event numbers. The only requirement is that no two producer nodes should have the same node number. The SLiM scheme presently limits the number of producer nodes to 255. 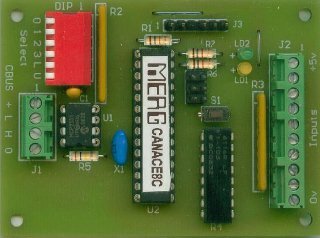 There can be any number of consumer nodes in principle but the CAN bus transceivers will only allow 110 nodes total on a single segment. Inter-segment bridges (CAN-CANs) are in development. In addition to layout control, the same bus can be used for connecting handsets (or CABs) to DCC command stations or even to DC power systems. A complete DCC CAB / Command Station system is in development. 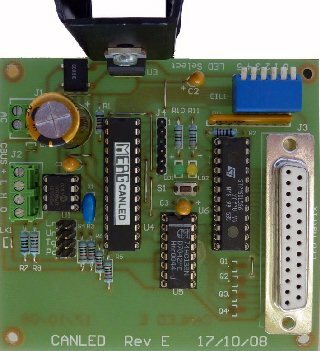 For DC systems, the relay driver modules are especially useful for block switching. While the above describes our SLiM (Small Layout Model) of CBUS, the principle is being expanded to the ‘Full’ model (FLiM) where all nodes / modules will be fully programmable over the same CBUS. This is intended for computer control of layouts and will allow a maximum of 65535 individual nodes. As the message structure and format will be the same for both SLiM and FLiM, there will be an easy upgrade path from SLiM to FLiM and both types of module will work together. Full technical information will be posted as soon as possible, together with schematics and complete constructional details, including PCB layouts for the various modules following successful ‘beta’ testing.